This program has been usefully developed on the Unity game engine to ensure a broad reach of deployment across a number of platforms, an essential requirement for a busy teacher working with a variety of devices and operating systems. Downloading the program is simple and you are immediately drawn into the programme environment, which is both calming; with the pensive piano background music and exciting; with the breezy cloudy background and a bright colourful collage of some of the screens that can be chosen. The cartoon student reminiscent of a Mario steam punk character in between two bright red shooting rockets gives the user a curious whiff of excitement where you are ready to embark on a new adventure. The start screen provides the user with the opportunity to enter their name or nick name which is saved on the defaults when they come back to another level, the icon also displays the current level beside the name. Clicking on a squidgy animated button displays the start screen. 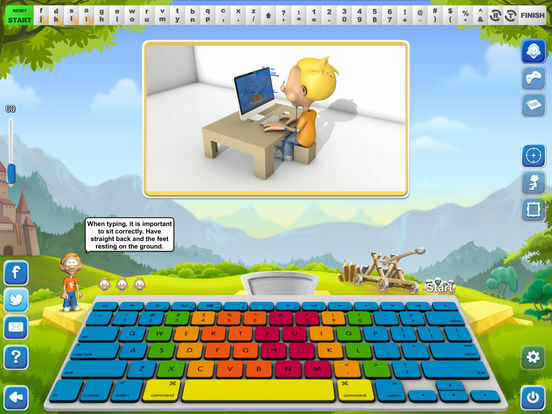 A good starting point is to bring ‘Dennis’ up who can help you determine if you are sitting at the keyboard correctly and instruct you on the correct postures and heights. The screen layout is excellent with a selection of six different themes, my favourite was the Chinese scene, each of these have their own unique set of animations that add to the sense of fun and amusement of the game. The keyboard icon at the bottom of the screen is well laid out and colour coordinated for each finger. The help icon usefully links to the ‘typing-fingers.com’ web site which is simply but professionally laid out with a comprehensive section on how to use the app and further descriptions on the importance of typing and the structure of the game. The look and feel of the website give you the reassurance that help is not far away with an indication of whether the developers are on line. A further link out to the now customary Facebook page reveals a thriving community users and the developers are keeping information current and interesting. 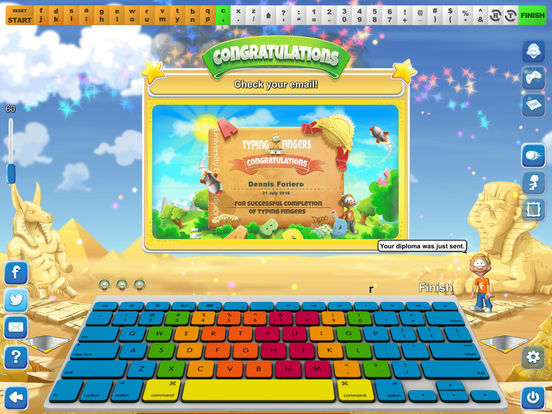 Overall the app is very good, I would certainly use it to teach my grandchildren the correct keyboarding skills, which, as I have stated before, are essential in this digital age and can give you the edge in the speed and clarity of communication. 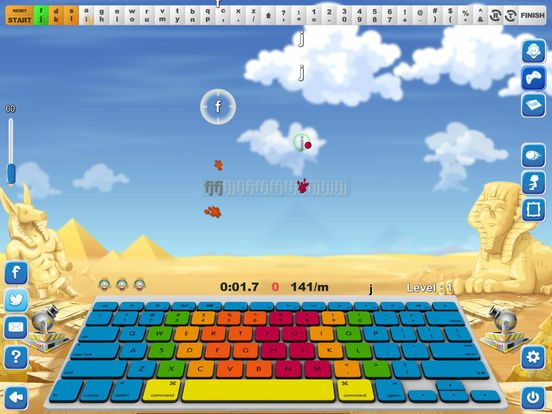 I would like keyboarding skills to be included in the curriculum and this application should be the one that is used to demonstrate how much fun it can be. I look forward to further games from this educational developer. Typing Fingers is an app that will teach you how to type the right way on your iPad.